Quirky independent or romantic comedies are hard to sell without a trailer. The posters for those kinds of films are always so bland, usually with a few people smiling, but not looking directly at each other, and just sitting there. 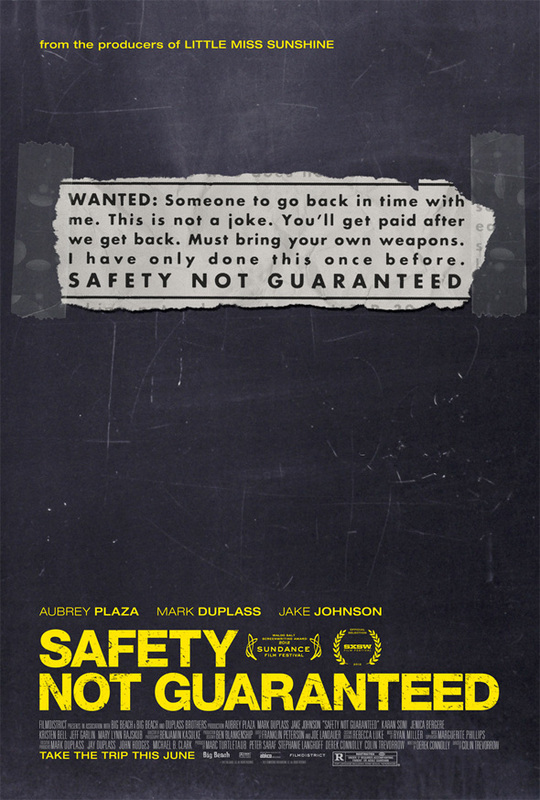 Thanfkully, that's not what we get with the first poster for Safety Not Guaranteed, the Sundance favorite from earlier this year which Alex and myself both loved, and for which we were quoted for in the film's first trailer. Rather than using its stars faces or any scene from the film, it uses the classified ad that inspired the story to draw audiences in. It's simple but effective and I just love it. See the poster below! i really like it! simple but pretty effective! cannot wait for this! Yea, this is a cool poster. It's got the simple, straight-forward focus on that classified ad, and the rest is gritty with a tinge that intrigues me. I like it. Finally watched the trailer for his that FSN posted earlier, even more revved about this.....this is like, "refreshing" cinema. Just nice to see these types of creative, fun and out-of-left-field kind of movies. Cant wait.